Join us on Saturday, May 4, 2019, to celebrate Cinco de Mayo at Cascadia Art Museum in downtown Edmonds. This family drop-in workshop will start at 11:00 am and end around 1:00 pm. Children, teens, parents, and friends are welcome as we celebrate Mexican history and heritage by creating art related to the famous Mexican artist, Frida Kahlo. 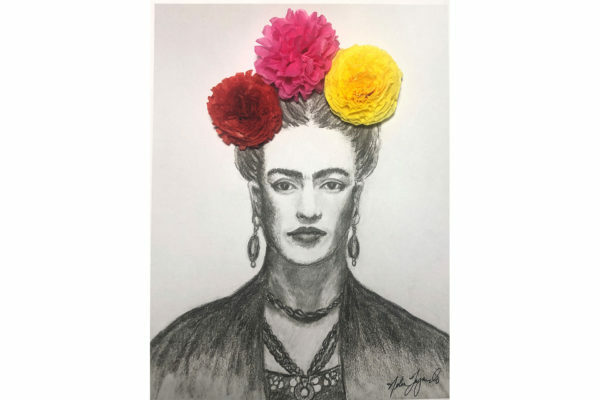 Everyone will be able to create one or more images of Frida and design and cutout colorful and unique flowers to celebrate Cinco de Mayo. Our featured guest artist for this workshop is well-known local artist, Nilia Fajardo. Nilia is a Cuban American artist who exhibits frequently in the Edmonds, Kirkland and Bellevue areas. She has constructed this delightful art project specifically for Cinco de Mayo at Cascadia Art Museum. Nilia will also share information about the life of Frida Kahlo and her contributions to Mexican art. All materials are provided and attendees can immediately take home their art. We hope to see you on Saturday, May 4, 2019 at Cascadia Art Museum,190 Sunset, Edmonds. The museum is only two blocks from the Edmonds waterfront. Parking at the museum is free. While you are at the museum, stop by the latest exhibit of Northwest art, Woodland Reverie: The Art of Helen Loggie and visit the charming museum store.